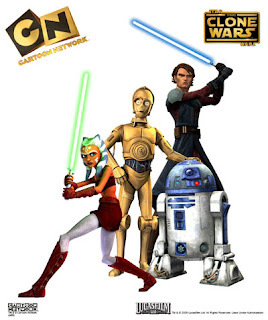 Alien Bee: 2 Preview Clips For STAR WARS: THE CLONE WARS Episode 420 "Bounty"
2 Preview Clips For STAR WARS: THE CLONE WARS Episode 420 "Bounty"
Here's two preview clips for STAR WARS: THE CLONE WARS Episode 420 "Bounty", airing tonight at 8/7c on Cartoon Network. This week, in "Bounty," an aimless Asajj Ventress joins a team of bounty hunters under the leadership of young Boba Fett. On an alien world, they undertake a dangerous but profitable mission that tests the limits of their skills, and the strength of Asajj's character. Dengar - one of the bounty hunters seen in the company of Boba Fett in The Empire Strikes Back - is coming to The Clone Wars, and actor Simon Pegg (Star Trek and Shaun of the Dead) is playing him in this week's episode.